Aggressive and violent behaviors are common in patients with neuropsychiatrie disorders. Patients with these behaviors are seen in a number of settings, including the psychiatric hospital, neurologic and neurosurgical wards, rehabilitation facilities, nursing homes, community residences and institutions for mentally retarded individuals, and prisons. The psychiatrist must be able to perform a complete and thorough neuropsychiatrie evaluation and to treat patients in these facilities. Unfortunately, training in these areas is sorely lacking, and these patients remain either undertreated or mistreated. 1. Tardili K. Sweillam A: Assault, suicide, and mental illness. Arch Gen Psychiatry 1980; 73:164-169. 2. Binder RL. McNiel DE: Victims and families of violent psychiatric patients. Bull Am Acad Psychiatry Law 1986; 14:151-159. Significant neuropsychiatrie impairment has been documented in seriously deliquent children, adolescents arrested for murder, and prisoners with violent behavior. "1"18 For example, Lewis and colleagues conducted comprehensive neuropsychologic examinations of 15 death row inmates, chosen because oi' the imminence of their execution, and not because of neuropsychopathology.,b All inmates had histories of severe head injury. five had major neurologic impairment, and seven had other, less serious neurological problems such as blackouts or neurological "soft signs." The presence of aggressive behavior in some patients with epilepsy is controversial.19 Bear and coworkers feel that patients with temporal lobe epilepsy frequently report intensified feelings of anger or irritability.20 Although other investigative teams have reported that only relatively few violent episodes occur during ictal episodes per se.21 Devinsky and Bear report that aggression during the interictal period is a frequent and serious problem.22 These investigators report that interictal aggressive behavior should be contrasted with aggression that occurs in frontal lobe disease. In frontal lobe-related aggression minor stimuli may result in brief aggressive outbursts, which are usually unplanned, unsustained. and ineffectual, in contrast to interictal aggression in patients with temporal lobe epilepsy in which patients may undertake an aggressive act for clear motive, often following considerable planning in response to objectively minor provocation, which may stem from moral concerns or a sense of outrage. In situations involving individuals with temporal lobe epilepsy, the perpetrator does not usually claim amnesia for the event and may. indeed, recall his aggressive behavior with much regret. The examples cited are representative of the large groups of patients with neuropsychiatrie disorders associated with aggressive or violent behaviors. Although the primary diagnoses of these patients may differ (ie. schizophrenia, mental retardation, traumatic brain injury, Alzheimer's disease), all of these patients have organic brain damage. DSM-III has called this diagnosis "Intermittent Explosive Disorder. 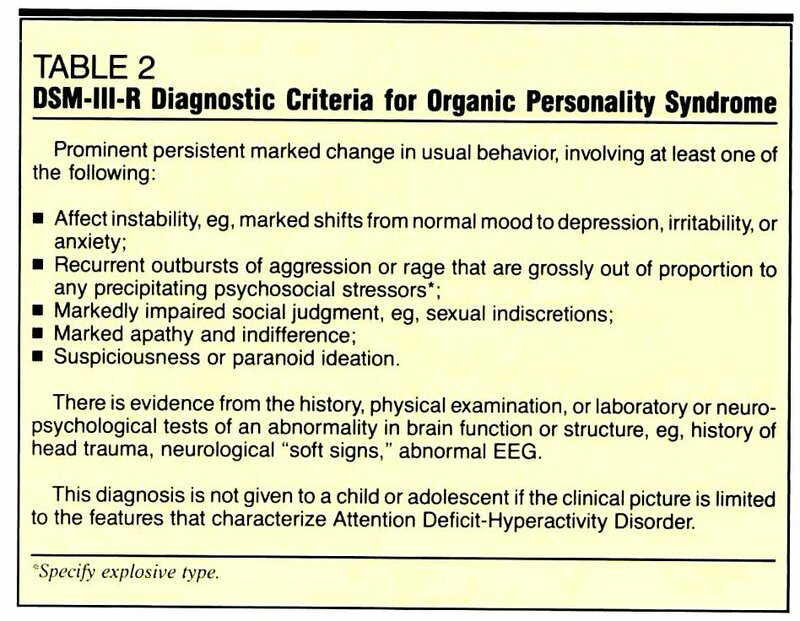 "2^ We have suggested that a more appropriate term would be "Organic Aggressive Syndrome," consistent with the fact that most cases have a recognizable organic etiology.7 DSM-III-R has partially adopted this position, and terms this disorder "Organic Personality Disorder-Explosive Type. "24 The criteria for this diagnosis is found in Table 2. This issue of Psychiatric Annals is devoted to the assessment and treatment of this large, but relatively neglected, population. In the first article, Eichelman explains the neurochemical bases for aggressive behavior. In the second article, we outline the importance of documenting aggression for purposes of the assessment and treatment of these patients. Elliott, an emminent neurologist who was the first clinician to use propranolol to treat aggressive behaviors in brain damaged patients, reviews the neurology of rage. Behavioral strategies in the treatment oi' aggressive patients cannot be ignored. Franzen and Lovell succinctly review these techniques. Although there is no currently approved medication for the treatment of aggression, effective pharmacologic treatments are available. We then review the pertinent literature and specifically focus on the use of beta-adrenergic blocking agents in the treatment of this disabled population. 5. Rossi AM. facobs M. Monleleone M. et al: Violent or fear-inducing behavior associated with hospital admission. Hosp Community Psychiatry 1985; 36:645-647. 4. Tardili K. Sweillam A: Assaultive behavior among chronic inpatients. Am J Psychiatry 1982; 159:212-215. 5. New York State Senate Select Committee on Mental and Physical Handicap: Violence Revisited: A report on traditional indifference in state mental institutions toward assaultive activity. Senator James H. Donovan. Chairman. 1977. 6. Reid HW, Bollinger MF, Edwards G: Assaults in hospitals. Bull Am Acad Psychiatry Law 1985; 13:1-4. 7. Yudofsky SC, Silver |M: Psychiatric aspects of brain injury: Trauma, stroke. and tumor, in Hales RE, Frances AJ (eds): American Psychiatric Association Annual Review. Washington. D. C, American Psychiatric Press Inc., 1985, vol. 4. 8. MacKinnon RA. Yudofsky SC: Psychiatric Evaluation in Clinical Practice. York. J. B. Lippincott Co.. 1986. 9. McKinlay WW. Brooks DN. Bond MR, et al: The short-term outcome of severe blunt head injury as reported by the relatives of the injured person. Journal of Neurology. Neurosurgery and Psychiatry 1981: 44:527-535. 10. Mann AH. Graham N. Ashby D: Psychiatric illness in residential homes for the elderly: A survev in one London Age Aging 1984; 13:257-265. 11. Rovner BS. Kafonek S, Filipp L, et al: Prevalence of mental illness in a communitv nursing home. Am I Psychiatry 1986; 145:1446-1449. 12. Reid AH. Bellinger BR. Heather BB. 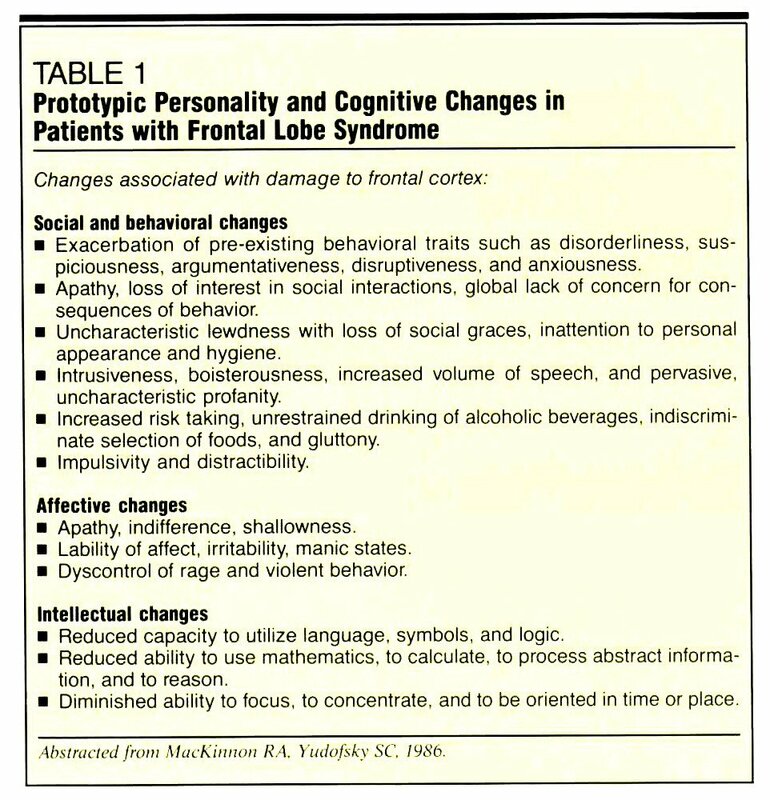 et al: The natural history of behavioral symptoms among severely and profoundly mentally retarded patients. Br J Psychiatry 1984: 145:289-295. 15. Hill BK. Balow EA. Bruininks RH: A national study of prescribed drugs in institutions and community residential facilities for mentally retarded people. Psychopharmacol Bull 1985; 21: 279-284. 14. Intagliata J. Rinck C: Psychoactive drug use in public and community residential facilities for mentally retarded persons. Psychopharmacol Bull 1984; 21:268-278. 15. Day K: Psychiatrie disorder in the middleaged and elderly mentally handicapped. Br J Psychiatry 1985; 147:660-667. 16. Lewis DO, Pincus HI. Feldman M. et al: Psychiatric, neurological, and psychoeducational characteristics of 15 death row inmates in the United States. Am J Psychiatry 1986; 143:838-845. 17. Lewis DO, Moy E, lackson LD. et al: Biopsychosocial characteristics of children who later murder: A prospective study. Am J Psychiatry 1985; 142: 1161-1167. 18. Lewis DO. Shanok SS, Balla DA: Perinatal difficulties, head and face trauma, and child abuse in the medical histories of seriously delinquent children. Am J Psychiatry 1979; 136:419-423. 19. Treiman DM: Epilepsy and violence: Medical and legal issues. Epilepsia 1986; 271:S77-SI04. 20. Bear D. Freeman R. Schiff D, et al: Interictal behavior changes in patients with temporal lobe epilepsy, in Psychiatry Update Washington, D. C. American Psychiatric Press. Inc., 1985. vol 4. pp 185-205. 21. Delgado-Escuetta AV, Mattson RH. King L. et al: The nature of aggression during epileptic seizures. N Engl J Med 1981; 305:711-716. 22. Devinsky P. Bear DM: Varieties of aggressive behavior in patients with temporal lobe epilepsy. Am J Psychiatry 1984; 141:651-655. 23. American Psychiatric Association: Diagnostic and Statistical Manual of Mental Disorders, ed 3. Washington. 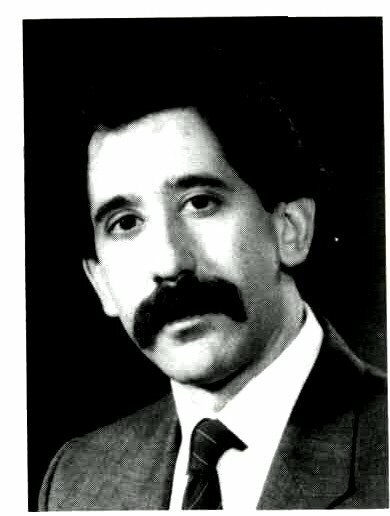 D. C., American Psychiatric Association, 1980. 24. American Psychiatric Association: Work group to revise DSM-III. DSM-III-R in development. Second draft. Presented to American Psychiatric Association. August 1, 1986. This work was supported in part by a grant from the Elizabeth Dollard Fund, and Mentul Health Clinical and Research Grant MH 30906-06 from NlMlI. The authors wish to thank Henrietta Wolland. 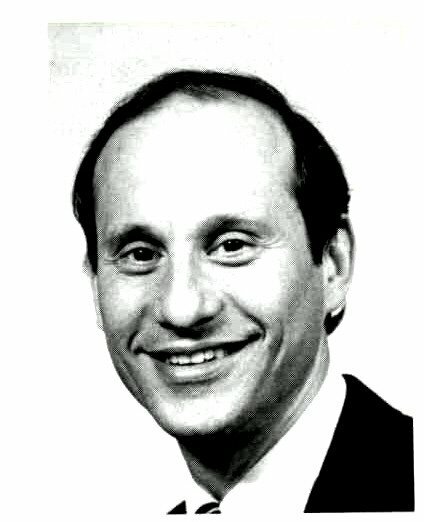 Barri L. KaIz. Ruth L. Kugelmass. and Jonathan Slater. MD. for their assistance in the preparation of this article.